Mercedes Benz owner Daimler and car supplier Bosch plan to launch a small fleet of driverless taxis in California in the second half of 2019. The move comes as the two firms race to catch up with competitors in the driverless technology industry. Daimler and Bosch have been working together on driverless technology since April 2017. 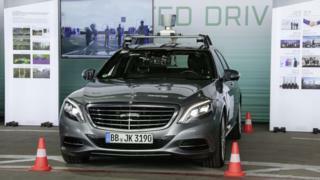 They have already received permission to test autonomous cars in Germany and China as well as in the US. But in California at least, the miles the firms have logged lag competitors such as Waymo and General Motors. Representatives for Daimler and Bosch declined to say where in the San Francisco area the driverless taxis will be offered or how large a pilot they are planning, citing ongoing negotiations. The firms said the service would be free and run on select routes, with taxis able to be summoned by app by passengers. The taxis, which will have humans on board to monitor performance, are expected to be open to the public, but the number of users is likely to be limited, they said. They will incorporate technology from US chipmaker Nvidia. Daimler announced a partnership with Uber last year, but the ride-hailing company scaled back its driverless car programme after a fatal accident earlier this year. Other firms continue to move forward. Waymo, which shares a parent company with Google, opened its driverless vans to a limited number of passengers in Arizona last year. California also issued its first approval for driverless shuttles to travel on public roads in March. Randell Iwasaki, executive director of the Contra Costa Transportation Authority, which worked on the plans, said multiple driverless car companies have approached the authority about getting in on the game, and he expects interest to grow. The authority is not in discussions with Daimler and Bosch, he added. “We think this has got some viability at least in suburban applications … and if it works here, then most likely it will work in any suburban application in the United States,” he said. Two driverless buses, manufactured by the French firm Easymile, are expected to start taking passengers in the city of San Ramon later this year, Mr Isawaki said. The vehicles, leased by the owner of the Bishop Ranch business park, are intended to help transfer employees at the site, reducing parking needs, he said. Public transit agencies are also planning to offer a driverless Easymile bus in nearby Dublin in Alameda County, Mr Iwasaki said.